Abe Lenstra Stadion is a football stadium located in the Dutch town of Heerenveen which is in the northern province of Friesland. Home to Sportclub Heerenveen since opening in 1994, the 26,100 stadium was designed by Alynia Architecten Harlingen bv. 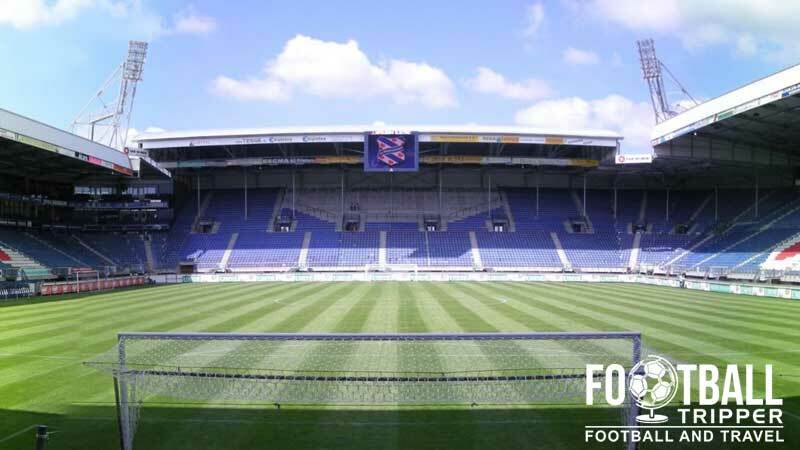 Heerenveen’s stadium first opened on the 20th August 1994 courtesy of Prince Willem-Alexander with the inaugural match held against PSV Eindhoven who’s side featured the young Brazilian superstar Ronaldo. Construction on the stadium began a year before with the original design consisting of 4 separate stands, although the club opted to fill the corners in with seating to create a more intimate arena. 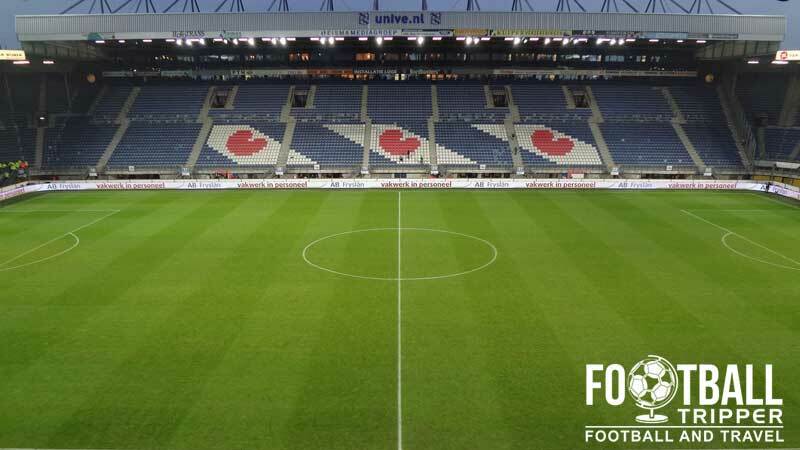 The ground is named after Abe Lenstra Stadion who is widely regarded by fans of Heerenveen to be the greatest player ever for the club, having jointed the club as a 15 year old back in 1920. He would then go on to play for the club before the best part of 17 years, making over 730 appearances where he scored a remarkable 700 goals across all competitions. Abe Lenstra stadium has undergone one significant expansion to date, with the 2002 renovations essentially doubling the initial 13,000 capacity to today’s 25,100. The club have twice now planned further developments in order to satisfy the growing waiting list for season tickets but progress has been frustrating: the 2011 expansion to 32,000 was seen as too risky and the expansion plans a year later for a scaled back 29,000 were put on hold due to the global economic downturn. The stadium was included as one of five stadiums along with Amsterdam Arena and De Kuip to host matches of the 2022 World Cup, although sadly the competition was awarded to Qatar (2022). A successfully joint bid with Belgium would have seen Abe Lenstra expanded to an impressive 44,000. Abe Lenstra Stadion is comprised of four stands: North, East, South and West. 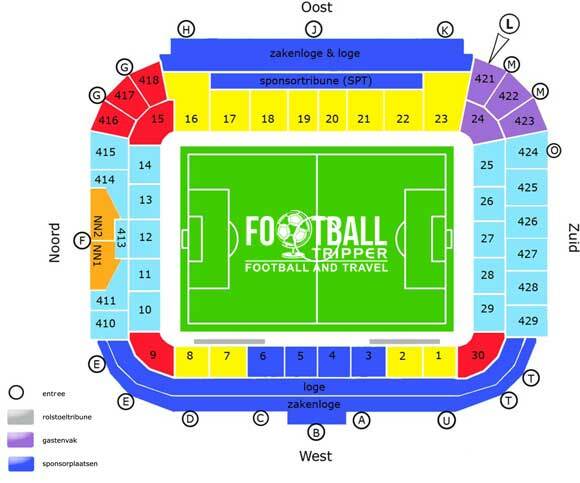 Away fans or “Gastenvak” are housed within the south-east corner of Abe Lenstra between the main stand (Oost) and the southern goal-end (Zuid) as highlighted in the above seating plan by the colour purple. Seating within the away section is divided into four sections across two-tiers if you will: section 24 is lower down, whereas sections 421, 422, and 423 are regarded as the upper. Less than 10 minutes north of the ground next to one of the car parks there is a McDonald’s which always does a roaring trade on matchdays. With the exception of the www.sc-heerenveen.nl/feansjop, the club shop at Abe Lenstra stadium is hands down the best way to purchase official merchandise of De Superfriezen. Please note that the club shop is closed on Sundays, and usually open for up to 2 hours before kick-off on matchdays, as well as 1 hour after the full time whistle. 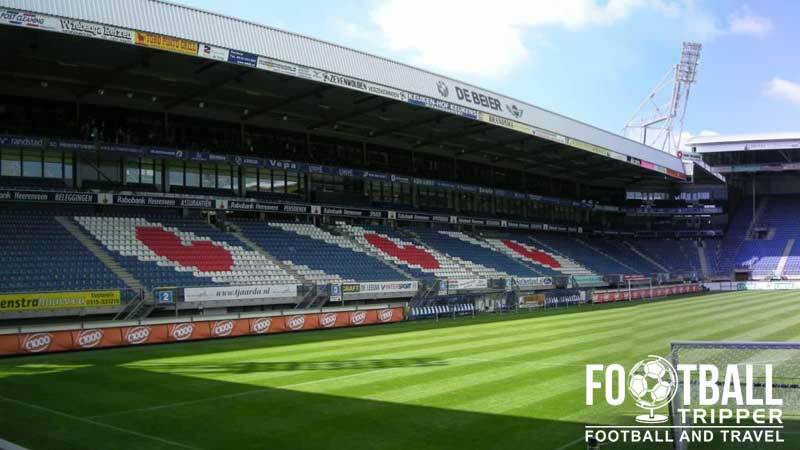 90 minute stadium tours of the facilities at Abe Lenstra Stadion begin from from only €7.50 per person with various packages also including food ranging from a coffee and cake to a full blown meal with a 30 minute film of the club’s history. Stadium tours can be booked by visiting this page on the official website, and are generally available six days a week with the exception of Sundays, bank holidays and matchdays. The blue and white colours of SC Heerenveen on display during a cup final against FC Twente. 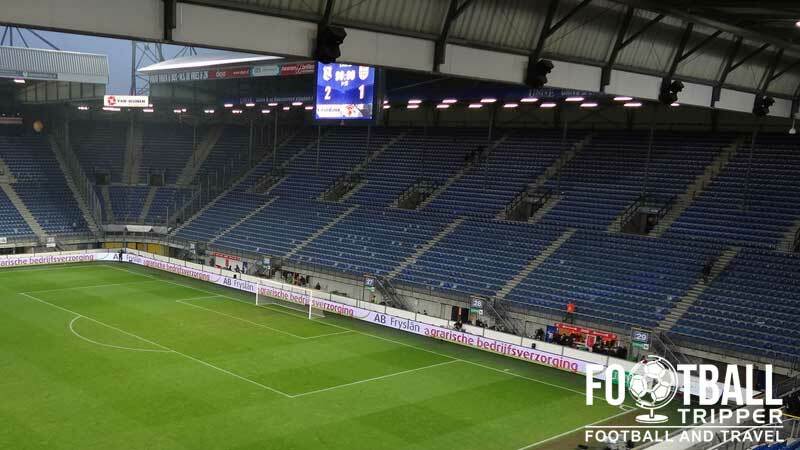 Tickets to see SC Heerenveen play at their home ground, Abe Lenstra, can be purchased online from the official website. We don’t currently have access to prices however expect to pay anywhere between €30 – 50.00 euros for a decent seat within the grandstand at the side of the pitch. Demand for tickets within the local area is usually quite strong so it is advisable to book in advance where possible. Abe Lenstra Stadion sits within the wider sports complex (Sportstad) of the same name surrounding by canals and the A32 motorway less than 1.3km from the city centre. The welcome sign adorning the main entrance of Abe Lenstrastadion. There are a total of nine car parks dotted around Abe Lenstra stadion however seven of these are reserved for season ticket holders, the players and, fans who reserve and guests of the club. The only car parks available to the general public on matchdays are car parks 8 and 9 which are capable of accommodating 1000, and 1,100 vehicles respectively. Spaces here are allocated on a first come first serve basis so make sure you get there early! Heerenveen railway station is served by two main train services to Rotterdam and The Hague which run approximately one per hour. Heerenveen railway station is 1.5 miles from Abe Lenstra Stadion which means it is walkable within 20 minutes. The closest airport is technically Groningen at a distance of 71 km away from Heerenveen however some Football Trippers may find it more convenient to fly into Amsterdam (138 km) and Rotterdam (198 km) which are much larger. The two main accommodation options sit just off of the A32 motorway at a drive of approximately 5-10 minutes of Abe Lenstra. Northwards just off of the A7 roundabouts you have Hajé hotel Heerenveen, and to the south there is the Fletcher Hotel-Restaurant Heidehof. Heerenveen city centre isn’t blessed with walkable hotel options unfortunately!